General Description of Cytokeratin 6. 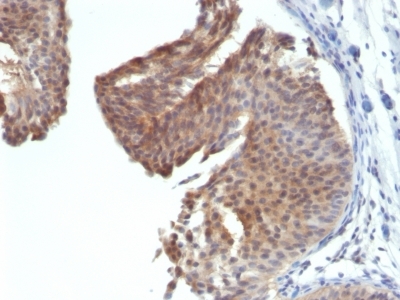 This MAb recognizes a protein of 56kDa, identified as cytokeratin 6 (CK6). In humans, multiple isoforms of Cytokeratin 6 (6A-6F), encoded by several highly homologous genes, have distinct tissue expression patterns, and Cytokeratin 6A is the dominant form in epithelial tissue. The gene encoding human Cytokeratin 6A maps to chromosome 12q13, and mutations in this gene are linked to several inheritable hair and skin pathologies. Keratins 6 and 16 are expressed in keratinocytes, which are undergoing rapid turnover in the suprabasal region (also known as hyper-proliferation-related keratins). Keratin 6 is found in hair follicles, suprabasal cells of a variety of internal stratified epithelia, in epidermis, in both normal and hyper-proliferative situations. Epidermal injury results in activation of keratinocytes, which express CK6 and CK16. 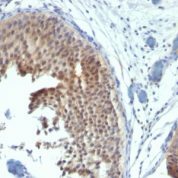 CK6 is strongly expressed in about 75% of head and neck squamous cell carcinomas. 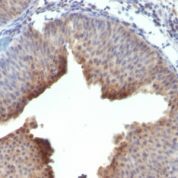 Expression of CK6 is particularly associated with differentiation. enQuire Bio's Cytokeratin 6 Anti-Human Monoclonal is available for Research Use Only. This antibody is guaranteed to work for a period of two years when properly stored.